Marketwatch reports that Benchmark Treasury yields touch 8-month high after 10-year note auction. NEW YORK (MarketWatch) -- Prices on longer-dated treasuries dropped Wednesday, pushing 10-year note yields to the highest since October after the government had to pay more to sell $19 billion in the securities at its second of three big auctions this week. The yield on the 30-year bond touched the highest in almost two years before that security is auctioned on Thursday. The yield on benchmark 10-year notes jumped 9 basis points, or 0.09%, to 3.95%. It earlier touched the highest since October. Two-year note yields increased 5 basis points to 1.36%. The yield on so-called long bonds increased 12 basis points to 4.79%, after earlier reaching 4.83%, the highest since October 2007. The Treasury Department sold the 10-year notes to yield 3.99%, the most the government has had to pay since August, and higher than some traders had anticipated. "The higher yield needed to get this done is what the bond market is focused on and the reason for further selling after the auction," said Peter Bookvar, a market strategist at Miller Tabak. The Wall Street Journal reports that treasurys down on russian central bank comments, supply. NEW YORK (Dow Jones)--A bout of selling hit Treasurys Wednesday morning on negative comments from a Russian central bank official and as investors pushed for concessions before a 10-year note supply. Rallying global stocks and crude oil prices above $70 a barrel also added to the downward move in Treasurys, as the need to hold safe-haven government debt waned. Bonds were down even as the Federal Reserve is set to conduct a round of buying targeting maturities between 10 years and 17 years late Wednesday morning. Long-dated Treasurys bore the brunt of the selling, pushing the 10-year note's yield to as high as 3.93%, the strongest level since early November and approaching the psychologically important 4% level. The last time the 10-year note's yield rose above 4% was back in October. In recent trading, the two-year note's price was down 1/32 at 99 5/32 to yield 1.31%, and the 10-year note was down 11/32 to 93 20/32 to yield 3.9%. The 30-year bond was down 30/32 to 92 18/32 to yield 4.72%. Bond yields move inversely to prices. The Interfax news agency reported that Russian central bank Deputy Chairman Alexei Ulyukayev said Russia plans to reduce the proportion of foreign exchange reserves it invests in U.S. Treasury bonds. Ulyukayev said reserves are just over 30% invested in U.S. Treasurys at present, but didn't specify by how much that figure would fall. Russia is the fifth-largest foreign owner of Treasurys, according to data from the U.S. Treasury Department. In March, Russia lifted its holdings in Treasurys to $138.4 billion from $130.1 billion in February. "We are scratching our heads because the Russian headline is nothing new but still it caused a spike in yields," said Sean Maloney, a fixed-income strategist in London at Nomura International PLC. Treasurys yields were also pushed higher ahead of a $19 billion reopening of the 10-year note sales at 1 p.m. EDT, the second leg of the government's $65 billion notes and bonds supply this week. With the 10-year note's yield approaching 4%, Maloney said he expected the auction may go "pretty well" as the yield becomes attractive. If the yield breaks 4%, it was a good opportunity to buy on dips in prices, he said. Already, a $35 billion three-year note auction Tuesday afternoon garnered strong demand thanks to a sharp rise in yields over the past few sessions. But many market participants cautioned that the real test is the 10-year note auction and the $11 billion in a reopening of 30-year bond supply Thursday afternoon amid rising worries about U.S. government's surging budget deficits. Wednesday, before the 10-year note auction, the Federal Reserve will conduct the second round of Treasury buying, targeting maturities between Aug. 15, 2019 and Feb. 15, 2026. The Fed has bought more than $153 billion in Treasurys since the $300 billion program kicked off in late March, but so far the intervention has failed to temper the rise in bond yields. With the 10-year note's yield approaches 4%, speculation has increased that the Fed may need to lift the size of the buying in its policy meeting in late June as a further jump in bond yields may push mortgage rates up more and hurt the housing market. Green Energy Investors reports about THE HORROR, Bond traders are white with terror. I want to talk about the bond market today as it relates to gold. And take you into the very real mind of a very real bond trader. Looking at a bond and gold chart is all very interesting if you like watching ivory tower movies. I do. But movies are not the whole picture. Experiencing the market thru the eyes of a real professional bond trader gives you a sensation of reality, in this case a most horrifying reality, that no chart can give you. I'm going to take you into the mind of a major bond trader who is a very good friend of mine. What's happening in bond land? The latest US govt bond auction was for $110 billion. Two years ago the average monthly bond auction total was $5 billion, $10 billion, numbers like that. The US govt finances its debt with bonds. A $2 trillion deficit means $2 trillion in new bonds needs to be issued. Approx. $200 billion a month. I want to take you inside the mind of a primary dealer. These are the approx. 20 dealers that have contracts with the US govt to market their bonds. The way the deal works in the govt's mind is: "You buy our bonds and sell them. You can short t-bonds going into the auction and bag a nice profit for yourself. But if you don't sell the bonds to your clients, guess who owns them? You do! If you don't like it, no more primary dealing for you, got it? And maybe we aren't so keen to hand over anymore bailout money or allow fraud accounting of your OTC derivatives. So play ball, or we take you out." I spent two hours yesterday meeting in person with a very good friend of mine who is retired as the largest govt bond trader in Canada for one of the primary dealers. He still manages $1.5 billion as a side gig. His minimum trade is $5 million. He looks like a pitbull and uses 4 letter words like Mr. Bernanke uses a greenback photocopier. He carefully detailed to me the horrors that began roaring thru the bond market, horrors that are growing, since the shocking $110 billion US govt bond auction was announced for this week. The bottom line is: There isn't enough money to soak up all the govt paper screaming down the pipe. The $300 billion in total that Mr. Bernanke committed to buy the bonds over multiple auctions, is a drop in the bucket. It's not enough. There is a daily competition for money in the world's bond markets. The US govt bond is the King Daddy of those markets. The primary dealers will do WHATEVER IT TAKES to sell those bonds. The primary dealers also carry tremendous power against the govt. Let's have a listen to their response to the Gman's "it's my way or the highway". Listen carefully. "How would you like it, Mr. Gman, if we announced that "sorry, we can't find buyers for your triple A rated toilet paper, we're going to announce to your public that you defaulted. Let's see how you do when we cut your credit cards up. You tell us what to do? Wrong. Go ahead, take away our primary dealerships. We're all standing together on this. We give the orders, not you. Got it?" What might those orders be? One order could be: "Your $300 billion commitment to buy T-bonds ain't gonna cut it. Try $3 trillion. Now get to your greenback photocopier start button and start pushing it. We'll tell you when to stop." While that action may be in the pipeline, as of today the ACTIONS taken in the bond market by the players are what is important. And those actions, believe it or not, are to buy bonds. Money is starting to come out of general equities, aka the stock market, and into bonds. Money is not coming out of bonds, it's going in. This is what the chartists don't understand. Money isn't just trickling in, it's pouring in. But it's not enough to meet the govt's skyrocketing demand for money! The losses in the bond market have pounded bank capital ratios. Balanced funds must now sell stocks and buy bonds to meet their mandated percentages. Losses on corporate bonds bought over the past year are staggering. Many hedge funds leveraged their purchases and are now in dire trouble. I have warned you all repeatedly about taking delivery of a portion of your stock certificates [very good idea. I didn't realize this was still possible]. Securing your gold. Holding 1 to 12 months expenses cash outside the banking system. The bond market auction was this week. Again, I want you to FEEL what the bond traders are feeling. They are white with terror. They aren't looking at some chart in internet candyland, they know there isn't enough money to buy all the govt bonds. Where we appear to be headed is for a test of the Dow lows [not sure I believe this]. You had better pray those lows hold [Shorting stocks is betting against inflation, don't do it]. Because if they don't, your money could become a target of the govt as its demand for money skyrockets, while the supply of money tanks. The ideal situation is a fast crash towa rds those lows with perhaps either the Dow transports or the industrials breaking, but not both [I don't buy this theory. If the stock market collapses again, it could cause a run on the dollar, which would make selling treasuries even more difficult.]. While that happens, the bond market must rally. The nightmare situation is the Dow just slowly rolls down, and bonds mount no major rally. If both the Dow transports and the industrials break the lows, the global banking and brokerage system will likely be closed soon after that, the first of many such closes. Short selling would likely be banned [I doubt it. Short selling generates demand for treasury bonds (they are used as collateral)]. A national sales tax would be simply one of a zillion money grabs. If Ben Bernanke fails to drastically increase the Fed's purchases of bonds, another vortex of asset destruction is a near certainty, as the primary dealers will exert mindblowing pressure on the managers of other assets to move those assets into bonds. Some of the movement is being triggered automatically thru asset allocation algorithms. Let me repeat: money IS not just moving into bonds now, it is POURING in. But... that money is not enough to soak up all the bonds the govt is issuing. 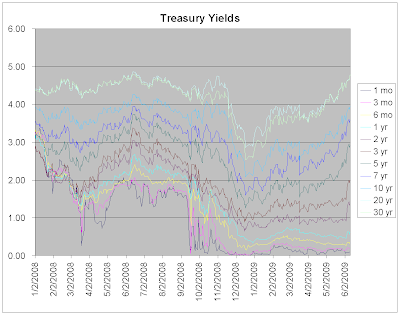 The chart below shows treasury yields for all maturities. Notice how long term rates keep moving up, and the US yield curve continues to steepen. My reaction: There isn't enough money to soak up all the government paper screaming down the pipe, which means interest rates are headed up. 1) The yield on the 30-year treasuries touched the highest in almost two years. 2) The higher yield needed to get treasuries sold is causing 'concern' (terror) in the bond market. 4) The Fed has bought more than $153 billion in treasuries since late March. 5) These purchases have failed to temper the rise in bond yields. 6) With the 10-year note's yield approaches 4%, speculation has increased that the Fed may need to lift the size of the buying. 7) Bond traders are feeling terror as they know this. Conclusion: The Fed is caught in the same negative feedback loop facing all central banks engaged in quantitative easing. I explained this process two months ago after a British bond auction Fizzled. 1) The Bank of England buys government bonds, expanding the monetary base. 2) Britain's rapidly expanding monetary base raises inflation fears. 3) These inflation fears decrease demand for UK bonds. 4) Decreased demand forces the Bank of England to buy more bonds to keep yields down. 5) This causes the expansion of the monetary base to accelerate. The Fed's treasury and MBS purchases will fall prey to this same dynamic, and quantitative easing efforts will prove to be exercises in futility. As this negative feedback loop gains momentum, we are getting closer to the monetization of the entire US national debt. This entry was posted in Currency_Collapse, Federal_Reserve, News_Developments, Wall_Street_Meltdown. Bookmark the permalink. Is that possible that the FED will tighten its monetary policy at a certain point in the near future, as some say? A kind of U-turn like that, would it not be even more catastrophic? Thanks. The idea of FED raising rates. Hahahahahaha! Not a snowcones chance in hell. "Where we appear to be headed is for a test of the Dow lows [not sure I believe this]. You had better pray those lows hold [Shorting stocks is betting against inflation, don�t do it]." I am confused here, Do you me all shorting or selective shorting. I figured to go long commodities and short the Dow. Is my stategy way off? I think actually there's nothing wrong with government printing money. Just make sure that money goes directly to real works, like building / repairing infrastructure. QE is a disaster because that money goes to help bankers improving their balance sheet instead of going to real works! Actually the PER for S&P; 500 right now is around 120x. I will bet that stock should going down from here, no matter how high inflation is. Even few hundreds percent of inflation is not enough to push stock significantly higher, only Zimbabwe style inflation can do that. USD - Rupiah rate jump from 2000:1 to 9000:1, groceries prices go up a lot (4 - 5 time higher), but stock market was going nowhere... Stock market didn't catch up until few years after the crisis is over, after 2002. If you are long commodities, you should be ok. I still believe stocks are going up in dollar terms (so it is dangerous to short them). There may be an inial drop as investors panic out of service sector stocks (market could possibly even drop back below 5000), but ultimately the DOW is headed 20,000 and beyond (driven up mostly by commodity stocks). It is what happened in Zimbabwe. Zimbabwe is buckling under economic meltdown, characterised by world's highest inflation last officially put in July at 231 million percent. Share prices went up 3,500 percent last year due to hyperinflation. Did those share prices rise before or after all those new larger denominated bills were created? From reading the article, it seems like it happened after those billion dollar bills were created. And i can understand why stocks would rise after those bills were created but not before. It's the same issue with bond rates. The govt. is trying to keep bond rates down by printing more Fed Notes and throwing it in the bond market to stop defaults(which is the reason for the rates climbing). I think it will be a waste of time to invest in the stock market even if there will be a future rally because in order for us to have this rally zimbabwe size bills will have to be created, by that time inflation will be way high. More people will be well in to focusing on buying physical things than investing in the stock market which's seemingly high return will be nothing compared to the rise in prices. So i wouldn't fear shorting the stock market BUT i wouldn't short it for the same reason. I wouldn't short it because the return you win from the bet will be wiped out by the high rise in prices of other things(which will come in the short term). I also wouldn't be in the commodities futures/paper market because the higher the price rises the more risky and illiquid the stock/bond becomes. The price is the risk premium, the higher the price rises the more risky it is, meaning the greater the chance of you getting stiffed on delivery and settlement. So in the short to medium term commodities will rise but their paper promises will be illiquid. So don't put money in to them(the paper commodities that is). In the short to medium term stocks will fall so don't go long. And in the long term stocks will rise but the price of things will be much higher by this time so don't put money in stocks waiting for this rally. I mean first of all, this rally will happen well in to the hyperinflation period, so for you to be able to even have the money to participate in this rally, you'd have to have something that would maintain it's value against the rising prices. Most people won't. This future rally in stocks, like today's will be mostly govt. influenced(govt. pumping money directly in to stocks). In fact I'm willing to bet that 100% of the Zimbabwe stock market rally was govt. influenced. Can you imagine some guy in Zimbabwe talking about investing in stocks? That's the same as loaning money. The people aren't doing that during hyperinflation, the govt. is. Anyway you're only chance at survival is hoarding physical gold/silver in your own personal private protected keeping. That's all you should be doing right now. Forget about trying to make that extra buck or 2 and get some physical gold and silver before it's too late. It's better for you to secure the physical gold/silver now than later. Then when you feel you have enough physical gold and silver, if there is still time you can try to make some extra cash through some arbitrage or stock short or whatever but priority should be survival gear, and survival gear is physical gold/silver.